Though her last credited movie role was the ludicrously accented Delacourt in 2013’s Elysium, Jodie Foster’s been keeping busy. She recently flexed her directing muscles on episodes of House Of Cards and Orange Is The New Black, and is now gearing up for her fourth feature film, Money Monster. For this “real-time, high-stakes thriller,” Foster has roped in some famous friends, most notably Julia Roberts and George Clooney, playing the producer and host of a Mad Money-esque television show, respectively. 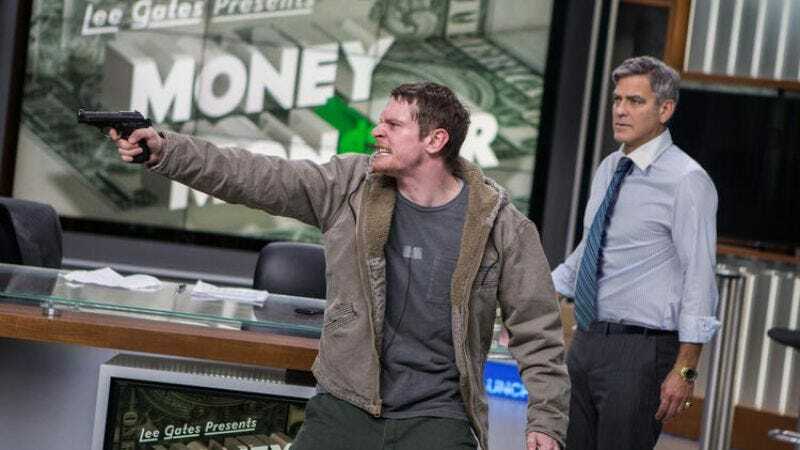 Their show (also conveniently called Money Monster) becomes the focal point of a nationwide conspiracy after being hijacked by a young investor with nothing to lose (Unbroken’s Jack O’Connell). It may seem like quite a thematic leap for someone whose last movie was The Beaver, but Jodie Foster been in the industry long enough to prove that she’s capable of handling anything. Even being Mel Gibson’s friend. Money Monster opens nationwide on May 13, but The A.V. Club and Columbia Pictures have an opportunity for you to see it for free on May 11. For your chance to win a pair of passes to the advance screening, simply follow the link here and enter your information. Remember: Advance screenings are often intentionally overbooked, so be sure to arrive early if you want to guarantee yourself a seat. An official plot synopsis and trailer for the film can be found below. In the real-time, high-stakes thriller Money Monster, George Clooney and Julia Roberts star as financial TV host Lee Gates and his producer Patty, who are put in an extreme situation when an irate investor who has lost everything (Jack O’Connell) forcefully takes over their studio. During a tense standoff broadcast to millions on live TV, Lee and Patty must work furiously against the clock to unravel the mystery behind a conspiracy at the heart of today’s fast-paced, high-tech global markets.